Over the past two decades, Neelima has been working on the issue of farmer suicides, and the causes behind them. HYDERABAD: A good man draws a circle around himself and cares for those within – his woman, his children. Other men draw a larger circle and bring within their brothers and sisters. But some men have a great destiny. They must draw around themselves a circle that includes many, many more. Lost in conversation with senior journalist and author Kota Neelima who was in the city recently to share details of her latest project ‘Widows of Vidarbha’, the above quote from 10,000 BC movie suddenly flashed my mind and made me realise that it fit her perfectly. Over the past two decades, Neelima has been working on the issue of farmer suicides, and the causes behind them. To find out the facts firsthand, which were conveniently ignored by mainstream media, she travelled to Vidarbha in Maharashtra, stayed there for a few weeks on and off and interacted with farmers. “Farmer suicides rose dramatically after 2001 onwards, especially in the cotton belt regions of then united Andhra Pradesh, Karnataka, Maharashtra and Madhya Pradesh. I wanted to investigate the reason. For ‘Widows of Vidarbha’ project, I interacted with the womenfolk whose spouses committed suicide, and felt their helplessness. There isn’t anything that prevents farmers from committing suicide”, she says matter-of-factly. Continuing on the aspects behind farmer suicides, Neelima says, “There are two phases. First, the government kept saying they died due to reasons such as alcoholism, gambling, etc. My investigation proved otherwise and showed that the deaths are a result of unpaid debt and crop failure. 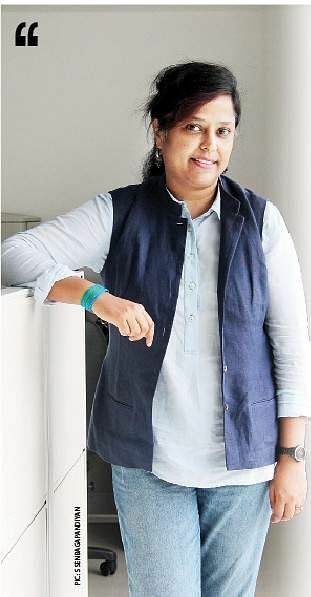 Her fictional work Shoes of the dead has been chosen by award-winning film director Vetrimaaran as the subject of his upcoming film. Neelima is also an artist who creates oil on canvas paintings that have been showcased at exhibitions around the world. On future goals, Neelima says she is exploring a subject called ‘Periphery’. “For example, if we take agriculture, all the policies are designed with the assumption that a farmer is a man. The same goes for financial policies. In most, if not all cases, a woman is not at the centre, she is at the periphery. The main point is distress faced by womenfolk in the country. I’m working on identifying distress and their peripheries,” she says, before signing off.